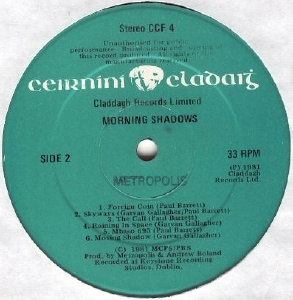 Band formed by session musicians Garvan Gallagher (ex Trench Band and Midnight Well among many others), Don Harris (ex Spud, Peggy's Leg, The Urge), Paul Barrett (co-owner of STS Studios located above Claddagh Records office in Dublin) and Ben Rice. Metropolis played light and nimble jazz-rock fusion, possibly pulling in too many directions at times and sometimes Ben Rice's sax seems to domiante proceedings too much for my tastes, but these are minor criticisms of an LP that is certainly worth seeking out. It's almost entirely instrumental, apart from occasional vocals. Nice cover artwork by Sonny Condell too. 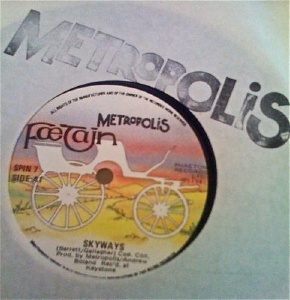 The album was preceeded by a single "Skyways" b/w "Avril" which included guests Greg Boland (Scullion, ex Supply Demand & Curve and Stagalee, guitar on the A-side) and Keith Donald (Moving Hearts, sax on both sides). 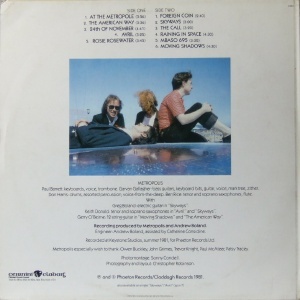 Both tracks are included on the LP. 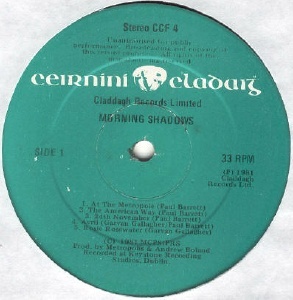 Their debut single was the last to be released on the short-lived Phaeton label while the album came out on the parent Claddagh label bearing the Phaeton logo. Garvan Gallagher was later in the Fleadh Cowboys and Mary Black's Band. 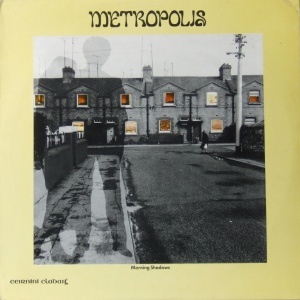 Not to be confused with the UK band Metropolis who released "The European Suite" LP on their own Havoc House label in 1985 (later on CBS) from which a potentially confusing promo single "Dublin" / "Theme for Liberty" was issued. All copies have a pressing fault on 'Avril' (it's present on the test pressing). 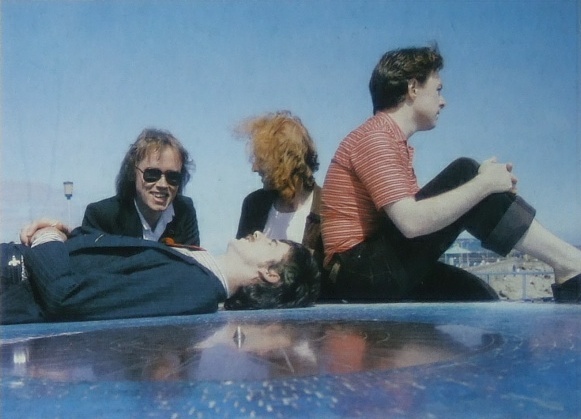 Recorded at Keystone Studios, summer 1981. Produced by Metropolis and Andrew Boland. Front cover photo montage by Sonny Condell. The bands name was omitted from the printed label. This was rectified with a hand-stamped "Metropolis" present on at least one label. Guests include Greg Boland (guitar on "Skyways"), Keith Donald (saxes on "Avril" and "Skyways"), and Gerry O'Beirne of Midnight Well (12-string guitar on "Moving Shadows" and "The American Way". Also thanked are Owen Buckley, John Grimes, Trevor Knight (Auto Da Fe), Paul McAteer and Patsy Tracey.